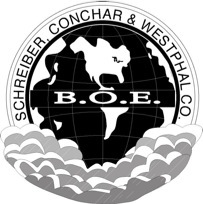 Representation of a trademark registered to the Schreiber, Conchar & Westphal Co. The B.O.E. (Best On Earth) brand was registered on June 27, 1897 as Trademark No. 30,254. Facsimile of paper label used on axes by the Schreiber, Conchar & Westphal Co. 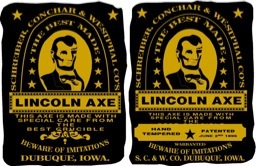 Representations of the two etchings used on Lincoln Axes marketed by the Schreiber, Conchar & Westphal Co. The Schreiber, Conchar & Westphal Co. succeeded the Westphal-Hinds Hardware Co. in 1892. The Westphal-Hinds Hdw. Co. organized in 1855 but traced its establishment back to 1853. Westphal-Hinds joined with Schreiber and Conchar in 1892 to form the wholesale hardware company that functioned under the name Schreiber, Conchar & Westphal Co.
William Westphal, the individual that had joined with Hinds in 1855, had died in 1869 leaving his share of the business to his wife. She in turn continued the business until the estate took over and joined with Schreiber and Conchar. The name Hinds was eliminated at that time and the company became the Schreiber, Conchar & Westphal Co. in 1892. Due to certain unexplained difficulties the hardware company didn’t really become operational until 1893. Schreiber and Conchar had operated the Schreiber, Conchar Mfg. Co. since 1888 and apparently that continued to operate under its own name, perhaps eventually as a division of Schreiber, Conchar & Westphal. The company continued under that name until 1904 when the firm was sold to the A. Tredway Co.
During its relatively short existence the company used three brands, one of which, the B.O.E. brand, was registered as a proprietary trademark. B. O. E. stood for “Best On Earth.” Another brand, the Hawkeye brand, was used on axes and possibly other goods but it was not a registered trade name. The Lincoln Axe brand may well have been the brand for which the Schreiber, Conchar & Westphal Co. became most renowned. Their successors used the brand until the late 1930s and it was copied to some degree by certain subsequent manufacturers. The Mann Edge Tool Co. was the exclusive maker of the Lincoln Axe during the years Schreiber, Conchar & Westphal Co. was in operation. More than one hardware concern used the initials B.O.E. in conjunction with the goods or products they handled. 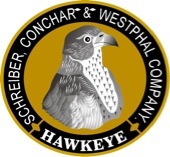 Although Schreiber, Conchar & Westphal Co. trademarked the brand in 1897, it is quite possible it was either sold or otherwise acquired by a competitor or manufacturer after the company was purchased by the A. Tredway Co. In regard to the registered brand B. O. E., it was used on axes along with the graphic representing the world along with some clouds. When it was used on other tools there was no room for a proper representation of the graphic design but the lettering was used in more than one way. One group of goods where the initials were used was on cutlery. Around that time the term cutlery was prolifically used on pocket cutlery, what are also commonly called pocket knives. Other sources indicate that the initials stand for "Board Of Education." This is true when used on hard rubber and at a later date on aluminum plane handles. The theory is that large municipalities either specified the handles when outfitting facilities or for retrofitting hand planes with handles for the purpose of cutting down on pilferage. This belief is substantiated by reviewing the specifics of Patent No. 928,227 issued to Charles B. Stanley in 1909 as well as advertisement information related to such handles as manufactured by the Stanley Rule & Level Co. Stanley started to make the aluminum handles, including those with B.O.E., around 1932. No special graphics are known that accompanied the initials on plane handles. Impressed markings observed on some tools other than axes. Markings used on cutlery sold by the Schreiber, Conchar & Westphal Co. Marking used by the Stanley Rule & Level Co. No known connection has been determined between the Stanley Rule & Level Co. and the Schreiber, Conchar & Westphal Co. The B. O. E. Markings that Stanley used are believed to have stood for “Board of Education” and were provided as an accommodation of some types of tools that were to be used in schools. WESTPHAL & HINDS HDW. CO.
SCHREIBER & CONCHAR MFG. CO.